There's a lot of female pilots in the military. There are 23 on the Blue Angels team, and Maj. Nicole Malachowski holds a position on the USAF Thunderbirds team. Remember the IOtD of the all female C-17 or C130 crew in Iraq? It would only be natural for these women to move to commercial aviation. You know where a female Pilot sits, right? There's a lot of female pilots in the military. Oh sure, there are certainly some. But I think there are fewer female-pilots-to-male-pilots than there are female-military-to-male-military overall, because women still can't go into "combat," and that's a lot of what the planes do. But my cousin's wife flew planes for the Navy, I certainly know it's possible. Then again, she also wanted nothing to do with commercial flying after she got out. 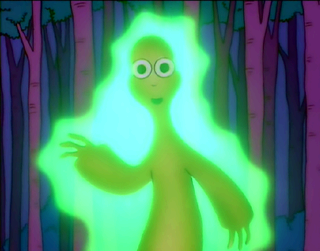 that's from the Simpson's episode where Scully and Mulder go to Springfield to see the glowing green "alien" which turns out to be Mr. Burns after his death-cheating treatments every week. He'd get a vocal chord scraping, drops in his eyes and a shot of morphine, go floating thru the woods saying, "I bring you love,"
if you go to the Wikipedia page of The Springfield Files (episode name) you'll scroll down and see a pic of the glowing green Mr. Burns...I don't know how to put it up here. Just look and see if it's the one. Aaack! Here come the nightmares again. i searched simpsons too.....kept getting that 3 eyed thing with the tentacles and the fangs. I guess it's not really the same shape.....but that's what i was reminded of anyway. I'm still waiting to hear where a female pilot sits. .....kept getting that 3 eyed thing with the tentacles and the fangs. Don't blame me - I voted for Konos.